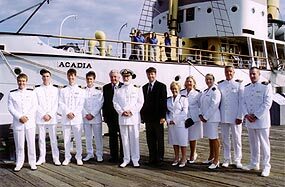 September 25, 2004 was an historic day for Halifax, the people of Nova Scotia and Cunard Line. 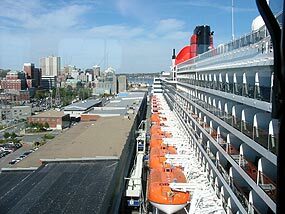 The Queen Mary 2, new flagship of the Cunard Line made her inaugural visit to Halifax, Nova Scotia, birthplace of Company founder Samuel Cunard on this date. It was a homecoming of great import, not just for those who came from all over the province and beyond to bear witness to the spectacle of the world’s most famous ship, but also for passengers, crew and Cunard Line executives present for the occasion to discover or re-discover the company’s Canadian roots… here, in Halifax, Nova Scotia. The arrival in Halifax of the Queen Mary 2 continues the unparalleled history of innovation and development of steam navigation which began one hundred and sixty-four years earlier with the maiden transatlantic crossing to Halifax in 1840 by the first Cunard flagship ‘Britannia’. The QM2’s two day visit was highlighted with a gala dinner at Pier 21 National Historic site by the Halifax Port Authority and hosted by Pier 21 Society. 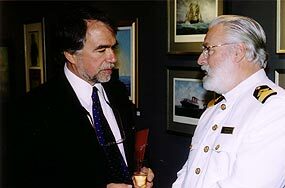 The dinner was preceded by a reception and formal opening by Commodore Ronald W. Warwick of ‘Cunard On Canvas – the Langley Collection’ – an exhibition of artwork from the collection of Cunard Steamship Society Chairman John G. Langley Q.C. featuring Samuel Cunard and ships of the Cunard Line from inception to the present time. The Maritime Museum of the Atlantic on Halifax’s waterfront hosted a public reception on September 26, 2004 at which time a financial contribution towards the costs of restoring a thirteen foot model of the ‘Franconia’ by the museum and the Maritime Modelers Guild was received from Cunard Line/Carnival Corporation by John Hennigar-Shuh, Director of the museum. Commodore Warwick in his comments acknowledged the fine work of the Modelers Guild in the restoration and refurbishing of the Franconia and later had a first-hand look at the model in the museum’s Age of Steam Gallery.